Accent Dental (Frisco) - Book Appointment Online! Our mission at Accent Dental is to build mutual trust with our patients. Accent Dental will supply responsible, rational, high quality dental care, carried out with the utmost respect for the patient. 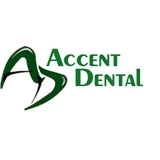 At Accent Dental we will treat all patients with respect and dignity, take time to listen and educate all our patients, provide safe and comfortable environment, be committed to high quality dental care by using the highest quality materials and techniques available. Stop by. I have always been very happy with the service and staff! Excellent work done on my teeth and professional manner of treatment. I highly recommend Dr. Wu!! !